Developers, 10tons, certainly have a sense of humour when presenting the game and from the outset you’ll be expecting heaps of EDF-styled ultraviolence and gore along with the promise of some depth with RPG-lite, perk-based game mechanics. Sounds pretty good, eh? Well, yes it does but Crimsonland‘s bluster starts to look a little silly as soon as you fire it up. 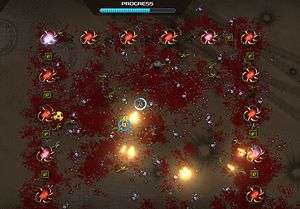 The game is, as expected, a twin-stick shooter that sees you fending off hordes of enemies (various bug creatures and aliens) who make a beeline for you in increasing numbers. The meat of the game is in the Quest mode that takes you through six worlds, each broken into ten levels. Each level is a plain arena with no environmental obstacles to hinder you (or use as cover) and so really the only difference between them is the large, plain, static graphic that serves as the background. Enemy tactics are to bum rush you. The occasional enemy will shoot at you but this is quite rare. So, consequently, your only tactic is to circle around chipping away at the large biomass that is following you, and chipping away at your health, in each stage while trying to get to the powerups and extra weapons. Kill enough enemies and you’ll move onto the next stage with the tenth and final one of each world being a boss battle of sorts. Over the sixty levels, that makes the game more of a grind at times. Ploughing through the Quest Mode does however unlock various Survival game modes (well, five) as well as perks and weapons that you can use to prolong your mayfly-like life expectancies in those modes. When the leaderboards get going, there might be some extra fun to be had here and picking the best selection of perks in between waves does add a little depth to proceedings but not much. Since Geometry Wars wowed Xbox 360 gamers, the twin-stick genre has been massively oversubscribed and it has been something of a mixed bag with stone cold classics and plenty of lesser imitations and so you really need something to make your game stand out. Crimsonland‘s thing is to throw in lots of blood and really this has no bearing on the gameplay at all and isn’t particularly effective visually either. The XBLA shooter Death By Cube tried the same trick, and arguably did it better (it had stark white backgrounds that contrasted with the blood a bit more), and that couldn’t elevate that game in any way. The game that Crimsonland most resembles in terms of gameplay, visuals and attitude is the Xbox Indie darling I MAED A GAM3 W1TH Z0MBIES 1N IT!!!1. The viewpoint, and distance, are about the same (Crimsonland is a little further out as PS4 devs seem to love tiny graphics for some reason), the allocation and type of powerups/weapons are similar and both games think they are a bit mental. In the case of IMAGWZII, it was. It disguised its simplistic gameplay well by varying up the enemies in quick fashion, throwing mad visuals all over the place and, of course, it had the best in-game music of any game ever. It also knew when to stop (the game lasted around ten minutes). By comparison, Crimsonland, doesn’t do any of that. The ordinary graphics, static backdrops, generic soundtrack and repetitive gameplay give the game a very cheap feel and if this was a 69p Xbox Indie title that’d probably be a bit easier to swallow but when I’m playing something that’s clearly worse than my fave indie game but on my shiny new PS4, I can’t help but feel like it needs to get out of my face immediately. Crimsonland will be finding its way to the Vita in the next couple of months (and will be a cross-buy title) and I think it’ll feel better suited to that format but as a game for the PS4, this just isn’t good enough. The game has four-player local co-op but keeping three of your mates interested in this after the first stage may well be impossible. Crimsonland should have been right up my alley. I like the genre and I've got an usually forgiving attitude for indie games, but where this might have been a good extra in a proper retail game from the PS2-era, on a PS4 it feels far too basic and, contrary to the game's media, kind of stuffy. 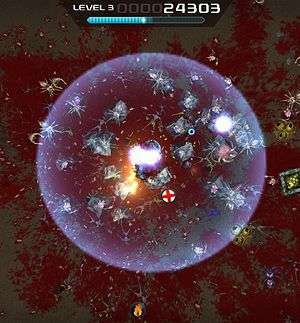 A bit of blood isn't going to cut it in a genre that has the visual flash and variation of Geometry Wars, the crazy humour of I MAED A GAM3 W1TH Z0MBIES 1N IT!! !1 or the solid, high quality graphics of Renegade Ops. Crimsonland simply doesn't have the ambition, imagination or quality to cut it in 2014. Old PC game indeed, I still have a copy of this, just checked and it’s dated 2003. Talk about next-gen.